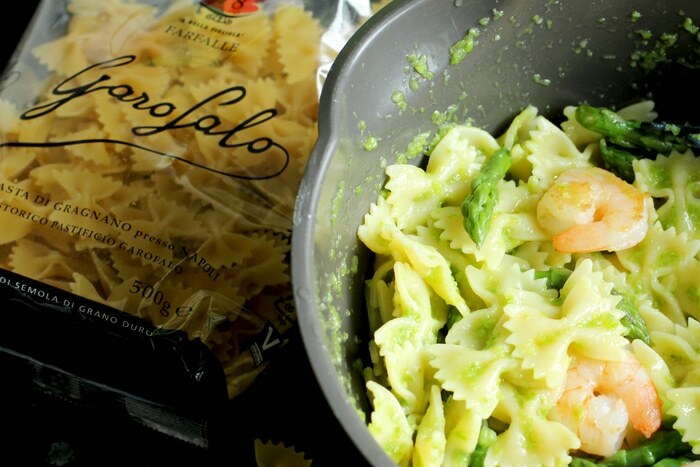 Fresh, light farfalle pasta with prawn and asparagus make Summer cooking effortlessly easy and quick! From the many summer recipes, pasta salads are some of my favorites to make. Ready in less than 15 mins, they easily feed a large crowd, and make a fantastic option for a party/bbq or a picnic. 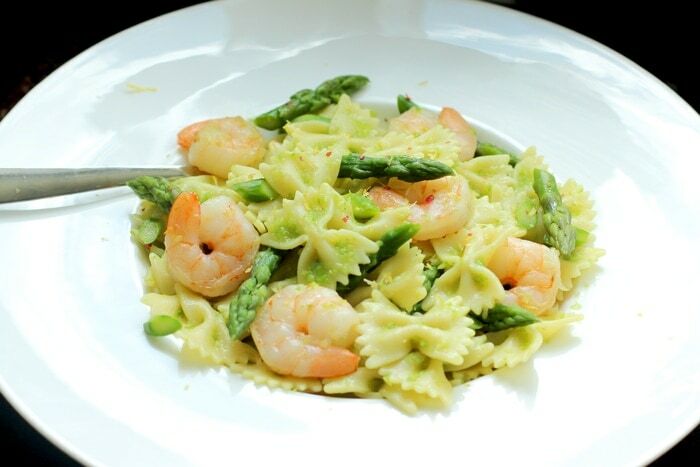 Asparagus and prawns are one of those evergreen combinations that never fail to bring a feast to your mouth, and farfalle pasta give the final touch to make a well-balanced lunch meal. You have everything you need on the plate. A good source of carbs to fuel you up through the day, a great source of energy for your body, and a good amount of vitamins, antioxidants and fiber to keep you light and healthy. 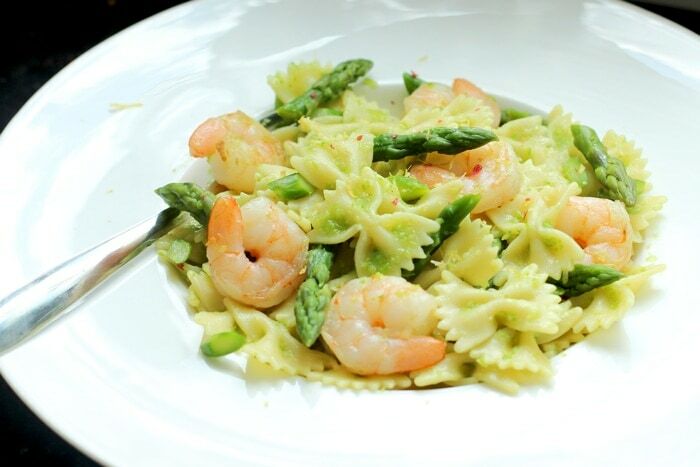 To make this showstopping farfalle pasta with prawn and asparagus, all you need is 5 simple well-sourced ingredients: high-quality pasta, fresh cleaned prawns, seasonal local asparagus, organic lemon zest and Extra virgin Olive Oil ( go for a lightly fruity Italian or Greek organic olive oil). Asparagus not only have incredible health benefits, their unique tasty flavour and versatility can instantly upgrade any dish to a fine-dining level. Blanched, grilled,or simply raw, there are so many ways to enjoy this vegetable. To take advantage of their high nutritional content, blanch them in boiling water for only 2-3 mins, until they turn bright green. Have a large bowl of ice water ready, drain the asparagus and immediately transfer to ice water for 1 minute to stop the cooking process. Use the stems to make a creamy sauce that embraces all the ingredients together. reserve the spears to add texture and bring a bright colorful touch to your pasta salad. The prawns are lightly tossed in extra virgin olive oil, seasoned with a pinch of sea salt and crashed pink pepper, then quickly grilled on a hot frying pan for 1-2 min on each side. 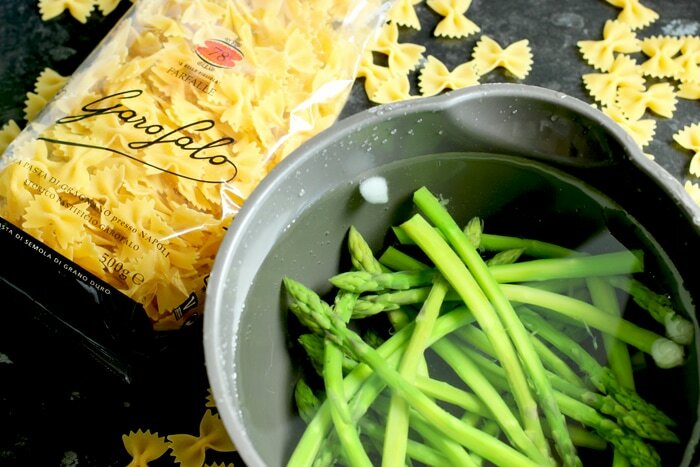 It’s fantastic how quickly they cook and paired with asparagus make a combo hard to beat. To make this recipe super light, I mix all ingredients away from the heat, so it’s more like a pasta salad. And I also skip any cheesy or dairy addition, so it’s totally dairy-free. If you’re looking for richer flavours, add shaved Parmesan cheese, a few dollops of crème fraîche or this amazing rocket pesto. They sound just YUM! The secret to the best pasta salad, relies on the pasta itself. You want to keep your pasta perfectly al dente, especially since you’ll enjoy it later on, sometimes the day after. For me it’s all about texture, so I always go for bronze died pasta. This kind of pasta is obtained by passing the dough through special moulds made of bronze. This process gives pasta a rough surface that attracts and binds the sauce perfectly. There are few italian brands out there that make great quality bronze died pasta. Garofalo is one of the most reputable, and I’m proud to be one of their brand ambassador. I spent most of my teenage years cooking up with my auntie, and she was the first to teach me the differences between average pasta and good quality bronze died pasta. Nevertheless to say she was a big fan of Garofalo, and so am I.
I’ve used the farfalle ( available in UK and US), this butterfly-shaped pasta is perfect with many light sauces and goes great in pasta salads. They’re so fun to look at that will instantly make you smile! The final touch of freshly grated lemon zest truly makes this farfalle pasta with asparagus and prawn one of the best pasta salads I’ve ever had. If you like things a little spicy, replace pink pepper with some red chili, it really gives a kick to the dish. This pasta salad has everything you need to make the best of the hot season. Healthy, light ingredients packed with summer flavors and ready in a matter of minutes! In a large pot of boiling salted water, cook the farfalle until al dente, about two mins before the package cooking time. In the meantime, blanch the asparagus in a large pot of boiling water for 2 mins, until they turn bright green. Reserve ⅓ cup of cooking liquid and drain the asparagus. Immediately transfer to ice water for 1 minute to stop the cooking process. Cut the spear off and reserve for later. 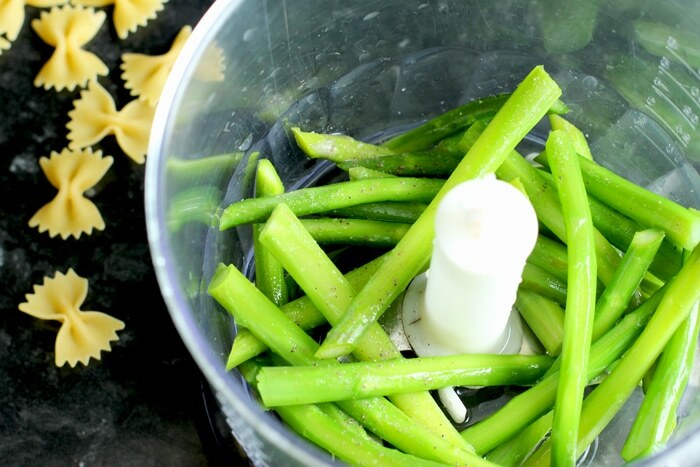 Transfer the asparagus stems into a food processor, add salt and pepper to taste and 1 tbsp of oil. While blending all ingredients, slowly add the liquid preserved until you reach a creamy consistency. Add prawns in a bowl,drizzle with 1 tbsp olive oil, salt and pepper to taste. Mix well until evenly seasoned. Heat a large grilling pan over med-high heat. When hot, add the prawns and grill 1-2 mins on each side. Drain the pasta and transfer into a large salad serving bowl. Add the sparagus sauce, the reserved spears, grilled prawns. Grate fresh lemon zest over the pasta salad, mix gently all the ingredients and serve at room temperature or chilled. Store in an airtight container for up to 1 day in the fridge.